android smartphone, macbook, game console, glasses and other small electronic devices. It 's an ideal gift for your friends or families who may like repairing or DIY. ❶100% new high quality, durable for long time use. ❷Easy to access and store at home and work. 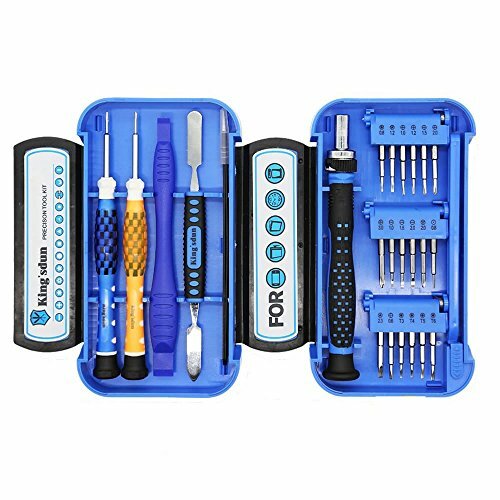 This Precision Tool kit are magnetic include all Iphone and Macbook screwdriver set, applicable all types of Iphone, itouch,Ipod, Macbook and other cellphones and small electronic devices. The Micro multi screwdriver bit include Torx(T3 T4 T5 T6),Triwing(0.6 2.0),Philips(1.0 1.2 1.5 2.0 2.0),Flathead(1.0 1.5 2.0),pentalobe(0.8 1.2),triangle(2.3) and pinhead philips(0.6), they're made of high quality CR-V steel, durable for long time use. Reversible Ratcheting handle, two directions adjustable, save labor,easy and convenient to use. You can also choose stop the ratcheting effect when it's not needed. It has excellent performance in repairs and maintenance of a variety of equipments. Complete & professional repair tool set,the metal & plastic spudgers tool help to open your devices easy without damages,this set also included an anti-static ESD tweezers for your repairs. Mini and pocket size, compact and well-organized, easy to access and carry.